This spring season, High Point Market was filled with exciting new designs, many of which looked to the past, taking inspiration from vintage style, and traditional classics. Brass was everywhere, a new version of glamour was in the air, and rich, saturated color, along with a handsome haberdashery story were told across the spectrum. Designer debuts, like those from Celerie Kemble and Aerin were followed up with equally strong collection additions. Also of note? The fantastic styling of showrooms, as they continue to look like fully realized showhouse environments. Many thanks to my sponsors for this market, the color-filled Wesley Hall and Chaddock, with its styled flair, I loved being welcomed into your worlds. The showstopper, Bernhardt's fantastic brass four poster bed. Teal and coral in combination was a palette that kept cropping up this season, and last. Here, Wesley Hall upholstered a sheltering high-sided tufted sofa in a teal velvet. It has just the right amount of detail. At Chaddock, the Feltrinelli loveseat by David Easton is an example of a clean lined piece with traditional roots. Following up on her grand debut, Celerie Kemble added many great pieces to her collection at Henredon, including this wonderfully whimsical ebony and faux bone-inlay star-base table. It is such a striking piece. 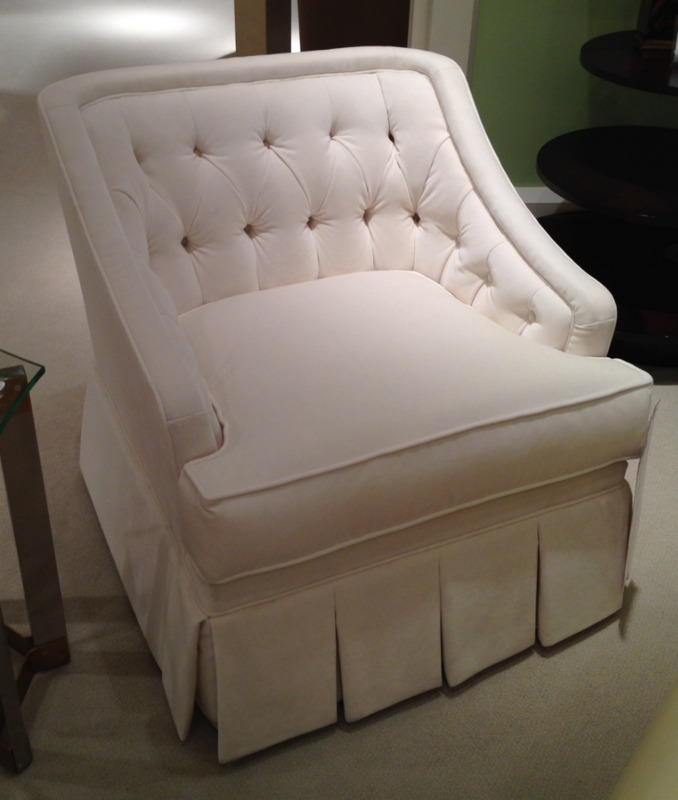 Layering in more vintage-inspired pieces, Celerie added this tufted side chair with femme kick pleat skirt. I know I have longed for this silhouette with its classic lines, now it is available. The swivel chair is having a moment. A bucket chair with vintage-influences, complete with swivel was covered in this zippy graphic geo print at CR Laine. AERIN also enhanced her collection assortment at EJ Victor, adding in some key pieces with vintage touches. Her new side chair, with cut out back and tubular upholstery detailing was quite chic. I love Emporium Home and the way they are influenced by 70' and 80's throwback style. This stacking circular table in a parchment colored finish has a swiveling top that expands to offer more surface area. Influenced by the great John Dickson and his trompe l'oeil pieces, Hickory Chair debuted a fun console made of wicker. Hardware accents can add such personality to a piece. Case in point, this new Easton chest from Oomph. You can choose from an array of brightly colored tassels as pulls. Such whimsy. Creating a radiating nailhead design, Thom Filicia's two door chest in a cerused finish at Vanguard is handy as a makeshift bar with storage. Always colorful Dunes and Duchess showed their new Chappy Etagere. It can be done in custom colors. Globe pendant lights have such presence to them. This new version from Visual Comfort reminds me of an antique globe on a stand, reversed. I love the white glass and simple chain detail. Luca Rensi, a founder of Bungalow 5 knows how much I adore diminutive pieces, so I was thrilled to see the new Isadora Tea table he launched this market. Wrapped in grasscloth, it is a stylish choice for beside a reading chair.